Experience 1001 culinary delights. 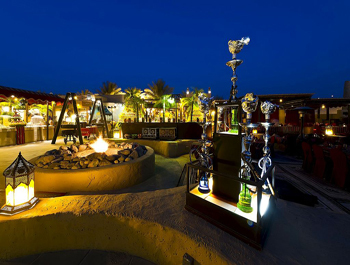 Like a scene straight out of an Arabian fairytale, Al Hadheerah Desert Restaurant is the place to experience traditional fare amid rolling sand dunes. 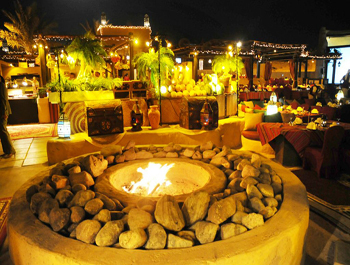 Here the mood of old Arabia is captured perfectly through the lively entertainment of belly dancers, henna artists, live bands and falcon displays. The décor recreates the magic of an ancient fort, with natural stone, rock walls and a sunken seating area. 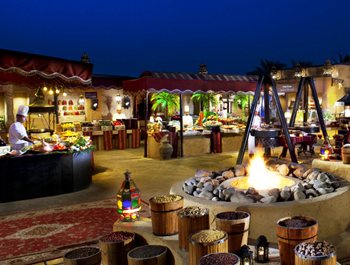 And there’s no mistaking the mouth-watering aroma of Arabic cuisine, as it drifts from the live cooking stations, wood-fired ovens and spit roasts.